Sometimes, all it takes to run 20 miles is a few beers. Saturday night, I met up with Laura, Jocelyn, and Theodora at Eataly. After I circled around the ground floor three times (partially looking for the elevator, mostly looking for free samples), I headed up to the 15th floor to sip some fine drinks at the roof-top bar. So far, all I had in me was a (very) strong bourbon drink that i nabbed for $6 at the tail-end of a happy hour in Brooklyn. So I was, ya know, ready to rage. Damn you, beer number three. I woke up to my alarm and was veeery close to shutting it off, turning over, and going back to sleep. But I got up for a second to stretch, and that’s when I noticed I was stillll a little drunk. (Way to go, Laura. Four drinks. You’re a champ.) So as I’m a little woozy, I feel both my feet on the ground. And at that moment, something in me really really wanted to run. So I made some coffee, changed into my running stuff, texted Jocelyn she was crazy but I was a bit crazier — and zoomed up to Central Park. The plan? Run a 15K race in Central Park (9.3 miles) and then leave the park and head down and back up the West Side Highway for the remaining 11. At that moment, I thought of it as going on two runs, both at a reasonable distance. It’s all a mental game, you see. The first half was great. We ran with Meggie, who’s an awesome runner and has been dealing with IT band injuries since well before the NYC marathon. This was her longest run since the race, and she killed it! 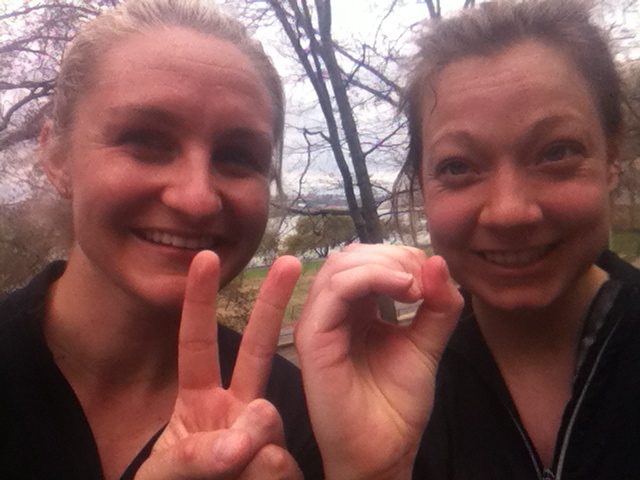 We spent the race chatting while keeping a steady 9:15 pace (despite the hills), and before we knew it, we were done. After the race, we said goodbye to Meggie, I quickly ate a banana and downed some gatorade, and then it was time to continue. In less than 2 miles, I’d be running into uncharted territory, and yet I felt fine. With hindsight, this is probably because I’m stupid and run my long runs at roughly the same pace as my shorter onces (7:45-8:15). 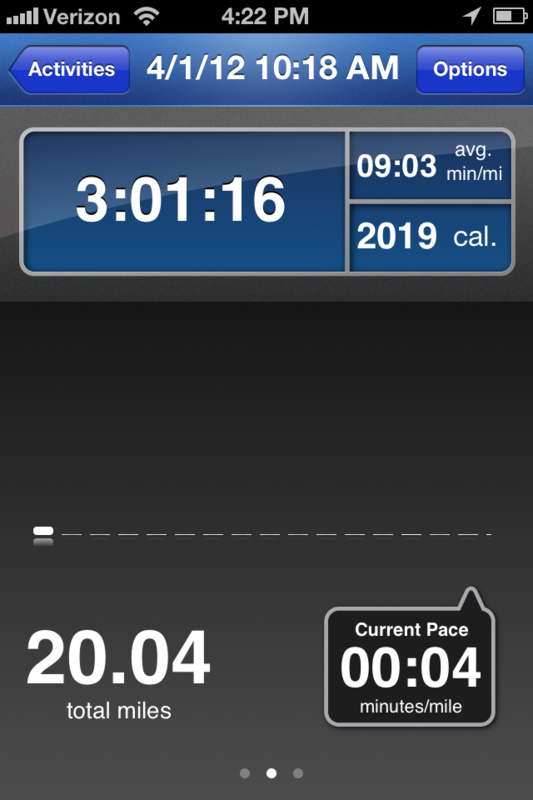 Boy… 9-min miles feel goood. So we meandered our way out of the park and down the highway. Still feeling aiight, Jocelyn and I exchanged past gentlemen histories (because what else do girls do with 9 miles left under their feet?) and kept heading south. Then mile 14 happened. 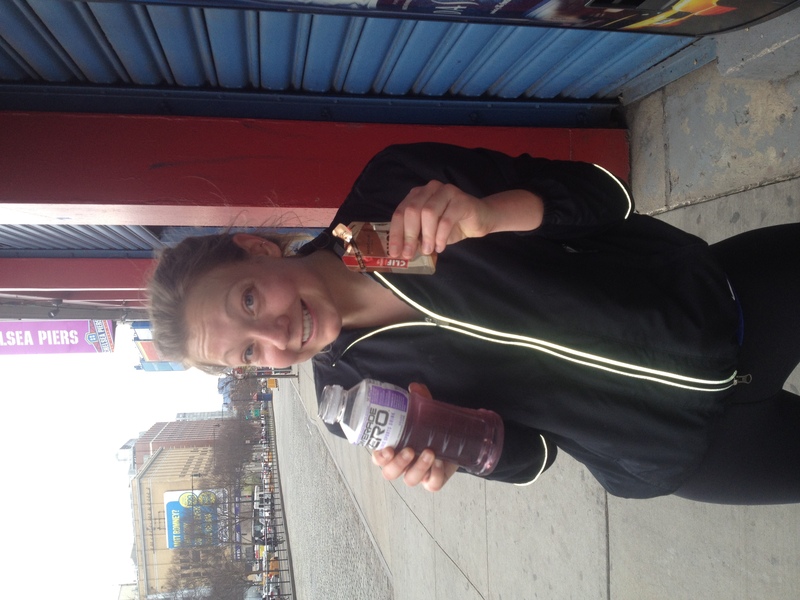 We were passing Chelsea Piers and decided to quickly grab a Powerade at the vending machines, and take a gu. But once we stopped, we were reminded that our legs were TIRED. Here we are….just when things started to get rough (even if we don’t look the part). As we headed to mile 15, I was beginning to hurt. Yet at the same time, I was unbelievably excited. I had no intention of running 20 miles, I’m not training for anything, and yet here I was, just going. I was tired, yeah, but I also felt strong. 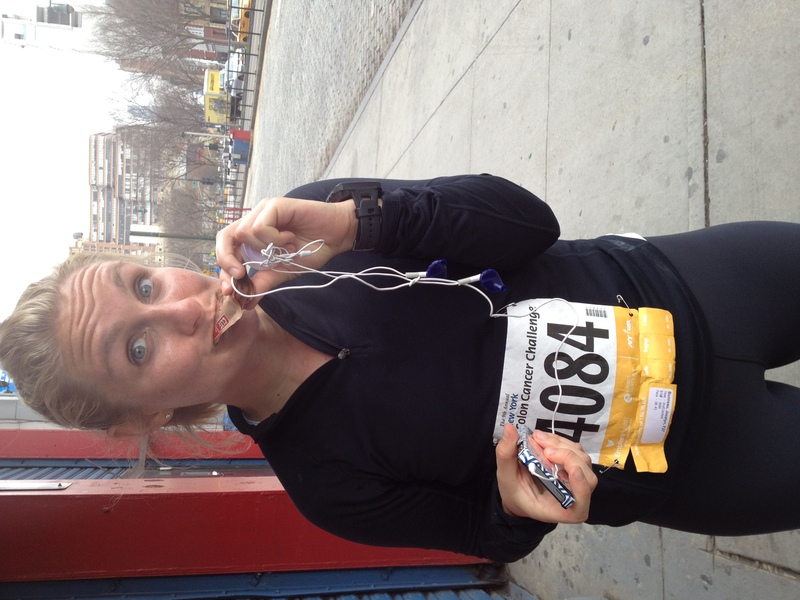 Still, I think it was at about mile 16 that I felt delirious. Probably dehydrated and hungry, things just felt a little off. At this point I felt weak, and wasn’t particularly thrilled to be, well, moving. At around mile 17, we ended up running next to a boy on his tricycle, who also was biking at around a 9 minute pace (copy cat). He kept swerving left to right slightly infront of us, and if we tried to pass him, he’d speed up. I was about to yell mean things at the little boy, because every swerve meant I had to do my own little foot dance, and I was so afraid that my legs would give out under me. Luckily, we were able to pass lil’ Lance, and continued back north. Less than 2 miles left. For the last two miles, I realized my legs weren’t tired, and despite having asthma, my breathing felt fine. Instead, I was just in…pain. My feet hurt, as if I was running barefoot. And it felt like little knives were stabbing my quads. Normal? Still, Jocelyn and I ended strong, and it felt good to finally stop running after 3 hours. For a sec. The worst was actually after it was over. It was harder to climb up the stairs, out of the park, and to Laura’s (to then go to brunch w/ unlimited cocktails, duh), then it was to run that last mile. My legs did not want to move. They were throbbing. They were really, really pissed at me. Still, a day later and I surprisingly don’t feel sore at all. Maybe DOMS will hit me tomorrow, so I’ll keep my fingers crossed. Until then, a lot of people are asking me when I’m signing up for a marathon. 20 miles is usually the longest training run for a 26.2, and yet I’m still hesitant. I would really like my first marathon to be somewhere AWESOME, but I would also want my family/friends to be nearby to cheer. And I’m still slightly mortified to run the whole thing — I think I was able to get up and run the 20 because I’m not on a training plan, I don’t have a schedule, or a goal. There’s absolutely no pressure. I didn’t have to run that long, which is maybe why I was able to take my free-will (and slightly intoxicated state) and just roll with it. Posted on April 2, 2012, in Uncategorized. Bookmark the permalink. 11 Comments. I think it’s a great plan while you are not working tordaws any particular race. Base training/maintaining is important and you could totally be on to something here!!! Good luck! So freaking proud of you!!!! I couldn’t have done it without you. Also – DAMN THAT LITTLE BOY! He is cute for the first .00002 of a mile. Hi! I just found your blog from Jocelyn’s, I love it. Congrats on running 20 miles, that is so awesome! !